The Charger (Part No: 100) is a super fast, powerful and portable machine, with a build quality you expect from Portek. With a convenient handle, strong chassis and wheels, the Charger can easily be positioned on any flat ground, ready to start work. Two large spinning flywheels, powered by a 1.5kw electric motor, drive the powerful ram with a force of 8.5 tonnes. The machine uses kinetic energy to hit your logs with high impact; cutting them quickly and safely. 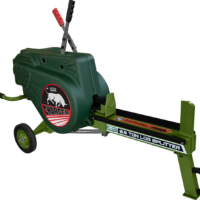 The Charger 8.5 ton impact log splitter uses kinetic energy to split logs in an instant. With a cycle time of under one second, this is truly the fastest log splitter you’ve ever seen. It works as fast as you do – no waiting around and no tiring crouching as with slow hydraulic machines.